There are so many things to consider about window treatments: color, size, function, style, price, fabric, durability, energy efficiency, etc! Available in a plethora of styles, window treatments leave many homeowners perplexed to find a solution. At Nest Expressions, we specialize in helping our customers select window treatments and flooring that is best for their lifestyle, budget, and personal style. A portion of our custom recommendations and installations are uploaded onto our Houzz for consumers to glean ideas. 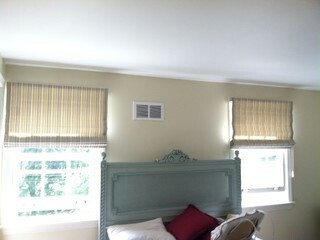 Take these traditional Roman Shades in the image above for example. Nest Expressions selected them because the neutral color tone allows the headboard and bedding to pop. These shades are great light filters and create a subtle glow that brightens the room, creating an enchanting ambiance. The delicacy of the Roman Shades further compliments the delicate femininity of the headboard, ultimately uniting the room in an aesthetically pleasing harmony. In this photo, Nest Expressions was asked to find window treatment solutions that were functional and durable for a room where kids play. Nest Expressions selected Poly Satin Shutters because they are easy to clean and extremely durable. Additionally the heavy horizontal of the shutters helps break up the vertical sequence of windows, adding dimension and visual interest to the room. 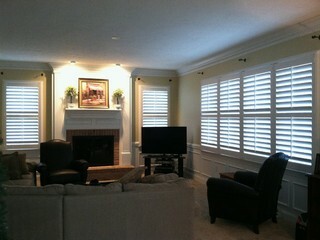 The white on the shutters brightens up the room, especially as the sun gently filters through. Selecting the perfect window treatments can be challenging, but at Nest Expressions, we specialize in helping you find flooring and window treatments that best suite your functional, aesthetic and financial needs. These images are just two examples from Nest Expressions projects on Houzz. For more great photos of Nest Expressions consultation and installation of premium window treatments, visit Nest Expressions Houzz page!